Fentanyl and its related compounds killed an estimated 25,000 people in 2017. The deadly synthetic opioid has been laced into heroin, cocaine, meth, and pills, creating lethal imposters and claiming more lives than any other drug in America. The counterfeit trend has continued to spread to new groups and new areas, leaving more families devastated as the overdose rate rises. In just a couple of years, a few isolated incidents became dozens, and now most of the United States have come face-to-face with this deadly assassin. In this article, we’ll look at how and why both legal and illicit drugs are being manipulated with Fentanyl and Fentanyl Analogs, and we’ll discuss the newest dangers of these counterfeit killers. The high profitability of counterfeit prescription pills and other illicit drugs laced with Fentanyl strongly incentivizes traffickers to continue producing them. Due to the increase in individuals abusing prescription pills, drug dealers are netting substantial profits, while those purchasing are playing pharmaceutical Russian roulette. Traffickers can typically purchase a kilogram of Fentanyl powder for a few thousand dollars from a Chinese supplier. A kilogram of Fentanyl can be combined and pressed into hundreds of thousands of pills, that than can be sold for millions of dollars in profit. Another comparison to the financial incentives and reason for the influx of Fentanyl can be made by considering what it takes to produce heroin. Heroin production requires secure plots of land and labor force to farm, monitor and maintain the poppies over several months. These factors contribute to the risk vs. financial reward for drug traffickers. On the other hand, Fentanyl and its analogs are synthetic (manmade) and can be created fairly easily in a lab. This makes Fentanyl easier and cheaper to produce while also alleviating a good majority of the risks associated with heroin production. Illicit Fentanyl first hit the U.S. back in 2005. Now, in 2018 Fentanyl and its deadly analogs have completely invaded the illegal drug market, hiding in plain sight as counterfeit prescription and illicit drugs are purchased and taken unknowingly by its victims. The following drugs are all being manipulated by this deadly assassin, and with deadly results. Oxycodone (Percocet): Oxycodone, a potent opioid pain reliever combined with acetaminophen, is intended to relieve chronic pain conditions. Sadly, most abuse starts with a legal prescription. The Deadly Outcome: An Indianapolis mother grieves as she warns others of the very real dangers of Fentanyl-laced pills. In March of this year (2018), her 24-year-old daughter (and a mother to 3 young boys) died after she overdosed from Fentanyl-laced oxycodone. Toxicology reports showed Carfentanil (the strongest and most deadly Fentanyl Analog) in her system, making this yet another tragic instance of Fentanyl claiming the life of an unknowing victim. Hydrocodone (Vicodin): Less potent than OXY (but just as addictive), Vicodin is one of the most prescribed painkillers in our country. However, familiarity and frequency of recommended use has numbed the public to its potential danger. The Deadly Outcome: In 2016, coinciding with a surge of Fentanyl hitting the streets of Minnesota, the counterfeit killer claimed the life of superstar musician Prince. The New York Times reports that the pills Prince was taking were almost entirely counterfeits of Vicodin, and a toxicology report obtained by The Associated Press found high concentrations of Fentanyl in his stomach, liver and blood. The musician was found dead at the age of 57 inside a Paisley Park elevator. Prince was known to have kept his drug dependence a secret by storing his painkillers in bottles of over-the-counter pain relievers. Xanax: Fentanyl is also finding its way into other prescription medications, including Xanax. Also known as “Xans” or “Bars” on the streets, the abuse of Xanax as a recreational party drug is bringing with it deadly consequences, especially when cut with Fentanyl. The Deadly Outcome: In November 2017, rapper Lil Peep was found dead before a show. The coroner determined he had died after a lethal overdose of Xanax mixed with Fentanyl. Xanax use has been glorified by hip hop artists and others in the music industry through social media postings and appearances in song lyrics and videos. Lil Peep is yet another musician who died too young, claimed by the counterfeit killer. Heroin: Fentanyl-laced heroin was the first counterfeit killer to make news. Due to the sheer potency of Fentanyl, you only need approximately 1/20th of the product to achieve the same high as heroin alone, and drug traffickers have realized that potential. The Deadly Outcome: Illustrated below, the vial to the left is a potentially lethal dose of heroin, equivalent to about 30 milligrams. The middle vial is a 3-milligram dose of Fentanyl, this is enough to kill an average-sized adult male. 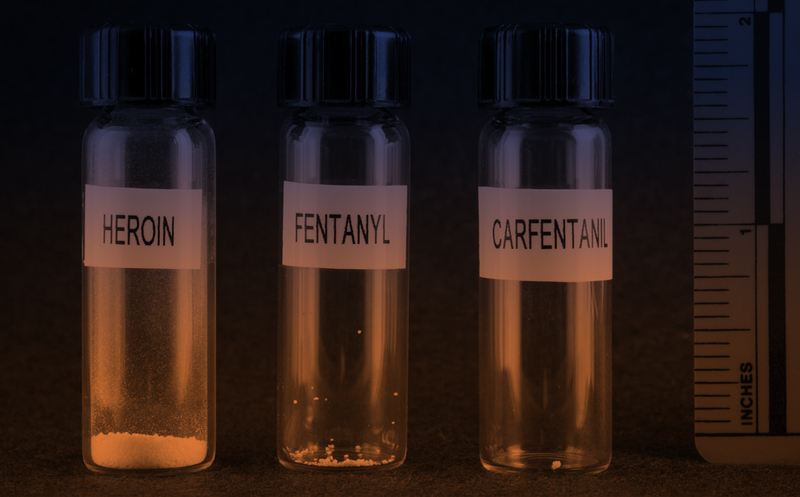 Carfentanil, the most powerful of the Fentanyl analogs, is shown on the right. Carfentanil is 10,000 times stronger than morphine; only 2-milligrams of Carfentanil is needed to knock out a 2,000-pound elephant. Cocaine: There is growing concern Fentanyl-laced cocaine will affect an entirely new population of the public, increasing the risk of accidental overdose and opioid dependence. Dr. Raymond Pomm (Creator of Project Save Lives) in an interview with News4(JAX) states “Innocent people who are using cocaine are going to start and have been overdosing and dying.” Generally, people who use cocaine do not have a built-up tolerance to opioids and are at an exceptionally high risk of overdose. The Deadly Outcome: Mixtures of cocaine and Fentanyl have been increasingly tied to fatal overdoses, prompting concerns among health officials in many states. In Boston, new data supports this trend, showing that nearly half of the 351 confirmed fatal overdoses reported in Massachusetts over a 3-month period in 2017 showed cocaine and Fentanyl present. The United States Fentanyl epidemic has been called “Chemical Warfare,” with the death toll continuing to rise daily. Throughout this series we have covered what Fentanyl is, the various potent compounds and the tragedy it brings. But where is Fentanyl coming from? 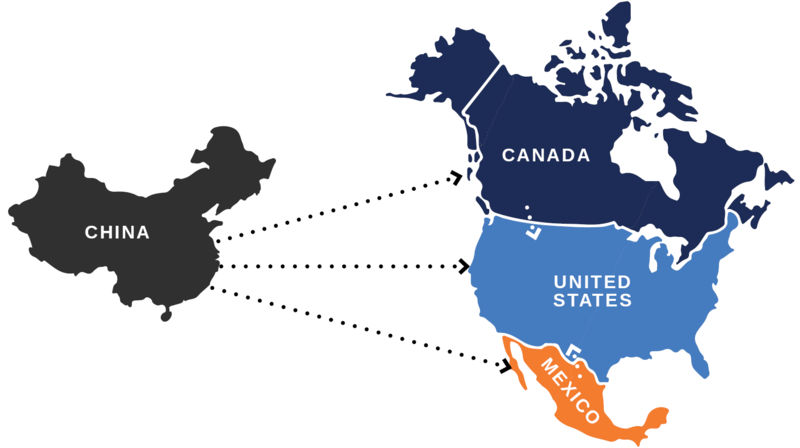 China is the primary source of illicit Fentanyl and its analogs, however there is more than one path Fentanyl is taking to the United States. Fentanyl — or precursor chemicals — often times are shipped to Mexico for the drug cartels to manage counterfeit drug production. Once produced, the Fentanyl heads north on well-established drug trafficking routes and in many cases is smuggled through the border near San Diego before hitting the various U.S. channels of distribution. Another pipeline from China to the U.S. has Americans anonymously purchasing Fentanyl online through underground channels. Fentanyl traveling this pipeline is commonly shipped in smaller quantities through the U.S. postal service. Mexican cartels are also utilizing this channel, as often times mailing Fentanyl directly to the United States goes undetected. The third pipeline finds Fentanyl being smuggled into less suspicious countries such as Canada prior to making its way to our streets. Fighting to seal these various distribution pipelines has proven to be an insurmountable challenge. The efforts require navigating political relations with China and Mexico, while also addressing weaknesses within our international mail systems here at home.